Synonyms are words which share the same meaning: e.g. lift or elevator, cheap or budget. They are often interchangeable in variouscontexts. When looking for ways to name your business or product, a systematic search for synonyms is often very helpful. Conduct a systematic search for synonyms and you will be surprised by how many interesting terms you will find. And since synonyms all stem from the keywords you started with, they are all related to your project. You will discover interesting concepts for your name which you won't have expected. You do not need to browse boring dictionaries to find synonyms, though: With the Synonyms tool from the Wordshop, you find many related terms for your keyword which have the same or a similar meaning. The Synonyms tool is especially useful if you want to base your name on your product's or service's characteristics. If you find interesting synonyms that are relevant to your project, just add them to your Word Depot. Test the Synonyms generator now! You can test the Synonyms tool right here on the page and perform up to five queries. Enter a single word and find lots of synonyms with just one click. 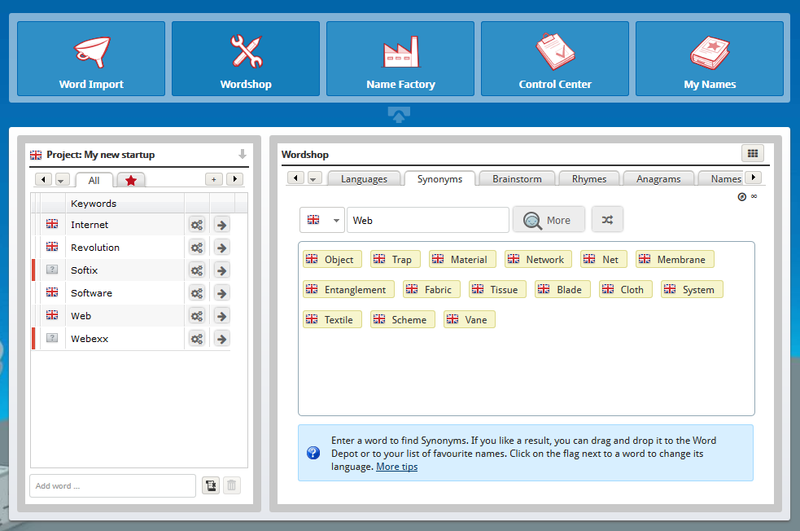 Go to the Synonyms tool in the Wordshop right now! If you don't have a NameRobot account yet, simply register and start looking for a name!